Encana Corporation (ECA-NYSE/TSX) got lucky with high gas prices for its Deep Panuke project offshore Nova Scotia—but the failure of that play does not bode well for New England natural gas prices. 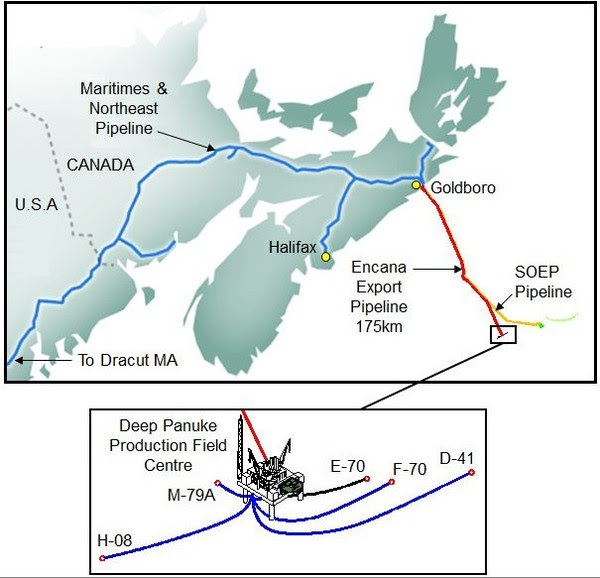 Along with Exxon’s Sable Island Energy Project (SOEP), also located offshore Nova Scotia, Deep Panuke was once expected to provide New England with ample natural gas supplies for years. This bounty of gas would allow for the accelerated closure of the regions coal and nuclear plants and encourage the conversion of homes and business away from fuel while keeping electricity prices at acceptable levels. Sounds great to me! However, things have not worked out according to plan. Despite high expectations after the initial discovery well drilled in 1999, Deep Panuke has had a troubled life. The project came online years late, over budget and after less than two years of operation, appears headed for a premature death as operational problems plague Deep Panuke. To be clear, offshore projects running into delays and cost overruns is nothing new. In fact, it is the norm rather than the exception. However, Deep Panuke’s problems combined with New England’s increased reliance on natural gas has created a toxic mix for consumers that will ensure the region will continues to have the highest prices in the US for natural gas. So what? Won’t gas from the Marcellus flood the New England market once pipelines are built and make Deep Panuke’s problems a distant memory over the next couple of years? In Part II, I will explain how it is extremely unlikely New England will receive enough gas on a daily basis to drive prices down towards levels that much of the nation has enjoyed the past few years. These prices were of course due to the Polar Vortex. To translate, $22.50 per MMBTU gas is the equivalent of $135 per barrel oil and was far above the national average city-gate price of $6.44 per MMBTU. (Source: http://www.eia.gov/dnav/ng/hist/n3050us3m.htm ). While many believed that Polar Vortex caused a once in a century spike in natural gas prices in New England, it didn’t. In fact, prices skyrocketed deep into the double digits only one year later. During the above average cold and snow of February 2015, Algonquin prices averaged $17.73 per MMBTU (Source: ibid) versus a city gate national average of only $4.55 per MMBTU (Source: ibid). Imagine that, in a world that was supposedly awash in cheap shale gas, major price spikes have occurred two years in a row. It wasn’t just the weather! While not good news for New England gas consumers, this was actually very good news for Encana. The #5 natural gas producer in the USA has been able to recoup a majority of its investment in the project since it generated $395 million in cash flow during the Polar Vortex Q1 2014. 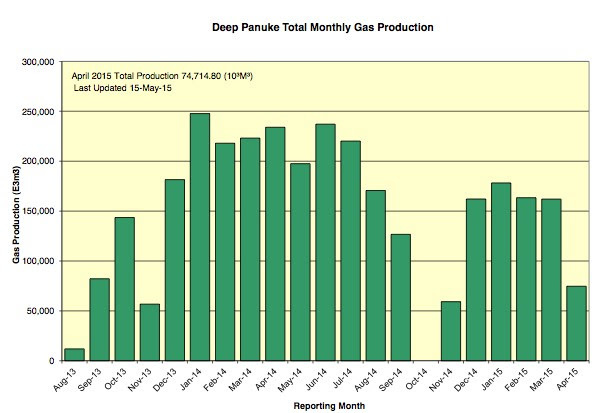 ECA was very lucky in that the start-up of Deep Panuke coincided with record high gas prices in New England. But operational difficulties and shortened reserve life of Deep Panuke mean this cash cow has now run dry—and that’s not good news for ECA shareholders or New England consumers. Shortly after discovery in 1999 by EnCana’s predecessor company, PanCanadian Petroleum, there were high hopes in the energy industry that Deep Panuke would marshal in a new era of exploration success in offshore Eastern Canada. Large international companies such as ExxonMobil, operator of the nearby SOEP which produced its first gas in January 2000, EOG Resources, Kerr-McGee and El Paso and others hoped that advances in 3D seismic technology would bring forth additional new discoveries. According to EnCana’s original development plan for Deep Panuke the field would begin producing up to 300 mmcf/d in 2010 with a mean expected lifetime recovery of 630 bcf and an expected average life of 13 years. However, first gas was not achieved at Deep Panuke until August 2013 at a cost of approximately $1 billion, nearly 50% over budget and three years behind schedule. Though Deep Panuke has been producing for less than 2 years, the end of its life is already in sight. The field produced an average of only 170 mmcf/d between November 2014 and March 2015, 50 mmcf/d or 23% less than the prior year period. It should be noted that this fall-off in production came despite gas prices averaging well into the double-digits during this period. Similar problems are emerging at Exxon’s SOEP where production has been falling for years and averaged 175 mmcf/d during January 2015. SOEP was expected to produce for another 13 years, however a recent regulatory filing by Nova Scotia Power suggests that Exxon will be shutting down the field as early as October 2016. With less than 80 bcf remaining at Deep Panuke should EnCana be able to successfully manage the unexpectedly high volumes of water that have encroached into the reservoir and Sable Island likely to shut down in 18 months, where is New England going to get its gas? I will explore that in Part II of this story early next week. Previous post: What’s So Bullish About Canadian NatGas?